The McIntosh Gallery Art & Travel Committee in conjunction with Alumni Western is comprised of volunteers who organize a range of art, architectural, historical, and cultural focused tours. They offer day trips to galleries, museums and institutes nearby; 2-5 day trips within North America, and longer international trips. They also present, in conjunction with member Mary Redekop, lecture series on a variety of art history subjects. 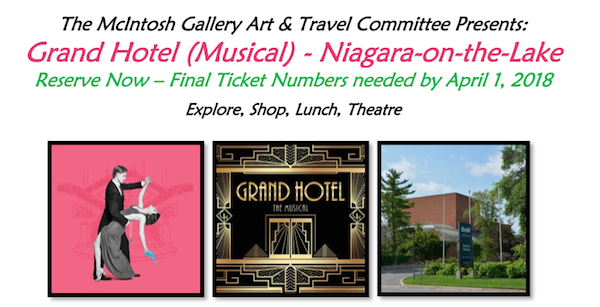 All profits from their activities are donated to the McIntosh Gallery in support of its acquisition and other agreed programs. The McIntosh Gallery Art & Travel Committee commenced their work in 2014 and have to date contributed funds for the acquisition of Shelley Niro's Parallel Worlds of Women and Warriors. Join Mary Redekop as she leads you on a journey through Central Italy’s exquisite hill towns. Part one of this course will take you to delightful little medieval villages like Monteriggione and Gropina and to major cities like Siena, with its Lorenzettis, Martinis and Duccios, and Assisi where we will find exquisite churches and painting by every major painter of the era in the Curch of San Francesco. Some of the other places we will visit are the Badia a Coltibuono, San Gimignano, Volterra, and Gubbio among many others. We will examine not just the painting, sculpture and architecture but the geographical, social, economic and religious influences on the art. You may take either or both sections of this two-part course. For registration and further information about this lecture series, please contact Susan Henderson, Alumni Relations & Development at susan.henderson@uwo.ca or 519.661.2111 ext. 85871. Includes Transportation, Guided Tour, Snacks and Gratuities. Impressionism in the Age of Industry: Monet, Pissarro and More explores how French Impressionist artists and their contemporaries, famous for their lush landscapes and sea vistas, were equally obsessed with capturing the spirit of the industrial age. The groundbreaking exhibition features over 120 artworks, including paintings, photographs, prints, drawings, sculptures and period films. With masterpieces by beloved artists like Monet, Pissarro, Degas, Van Gogh, Cassatt & Seurat, the exhibition highlights new favourites like Luce & Caillebotte. Includes Transportation, Theatre Ticket, Snacks and Gratuities. Stumbling upon a magical village that appears out of the Scottish mist for one day every century, Tommy, a modern boy, meets Fiona, a girl from the past. Should he stay with her in Brigadoon, or return to the world he knows and never see her again? This feast of song and dance from Lerner and Loewe has been entrancing audiences for more than seven decades. Classic songs like “Almost like being in love” and “I’ll go home with Bonnie Jean” will stay with you forever. Includes Transportation, Admissions, Guided Tours, Snacks and Gratuities. “The aim of the Aga Khan Museum will be to offer unique insights and new perspectives into Islamic civilizations and the cultural threads that weave through history binding us all together. My hope is that the Museum will also be a centre of education and of learning, and that it will act as a catalyst for mutual understanding and tolerance." The Moon, A Voyage Through Time: Wherever we are on earth, the moon glows up above, uniting us all. Feel the emotions that inspired centuries of artists and scientists gazing skyward. Explore the many meanings of the moon in Islamic cultures past and present. Observe and imagine the moon in new ways with the exhibition’s interactive devices, displays, and installations, including a giant moon sculpture connecting the Museum’s first and second floors. Architecture Tour: We will explore the architecture of the Aga Khan Museum, designed by Fumihiko Maki (Japan), and learn about key features of the site. With the fall of Crete, Mycenae and Akrotiri, Greece fell into a dark age until a revival in pottery appeared in the 8th century BCE followed closely by exciting new developments in sculpture and architecture. We will examine the four major styles of architecture, vase painting and sculpture in Greece, Anatolia (Turkey) and Italy and relate the underlying principles to such Greek thinkers as Plato and Pythagoras. This exhibition will follow Milne’s artistic development and journey into modernity as he moved from the bustling sidewalks of New York to the war-torn landscapes of northern France and back again to the woods, fields, and skies of the northeastern US and Canada. Through more than 90 works in oil and watercolour, never-before-exhibited photographs and drawings by the artist, and memorabilia collected by Milne during his time in Europe as an official war artist, Milne’s ingenuity in capturing landscapes will be illuminated. Includes Transportation, Admission, Lecture/Exhibit, Snacks and Gratuities. Curious about what it takes to mount an exhibition at the ROM? Join Dr. Alexandra Palmer along with members of the Christian Dior project team as they present the complex task of developing an exhibition – from inception to development to display. Speakers: Dr. Alexandra Palmer, Senior Curator and the Exhibition Project Team of the Dior Exhibition. After the lecture you will have the opportunity to explore the brilliance behind Christian Dior’s dramatic creations that revived the Paris haute couture industry after the devastation of the Second World War. Celebrating the House of Christian Dior’s 70th anniversary, Christian Dior features a selection of breathtaking designs from daytime to evening wear for grand occasions, and explores how and why Christian Dior’s iconic lines, luxury textiles, and romantic embroideries laid the foundation for the global success of the fashion house. Max 25 people - Reserve now! Located in the heart of Buffalo’s cultural district, the Albright Knox Art Gallery is a world class art museum. The gallery is a major showplace of modern and contemporary art. The Darwin D. Martin House National Historic Landmark was designed by Frank Lloyd Wright and built between 1903 and 1905. Built for the Larkin Soap Company executive, Darwin D. Martin, the complex is considered one of Wright’s greatest residential works during the Prairie House period, set in a harmonious landscape. Visitors will be able to tour the Darwin house and stroll through the grounds and Gardener’s House shop. Check into the lavish Grand Hotel, where the lives of ten hotel guests collide over one unforgettable night. Love. Betrayal. ￼Jealousy. Murder. And the glamour of Berlin in the Roaring Twenties. Soaring with songs and dance, it’s the mesmerizing ￼musical about what happens when our deepest, most desperate passions are unleashed. Winner of five Tony Awards. Prix Fixe Dinner at Canyon Creek Restaurant, across the street at 156 Front St.
Includes Transportation, Admissions, Architecture & Exhibit Tours, Snacks and Gratuities. In designing the Aga Khan Museum, Fumihiko Maki, winner of the Pritzker Architecture Prize, used light to animate the building in myriad ways: throwing patterns on the exterior walls of Brazilian granite, enhancing interior spaces, and illuminating the open-roofed courtyard. The building’s compact footprint — 81 metres long and 54 metres wide — contains an impressive variety of spaces, including two exhibition galleries, areas for art conservation and storage, and a 350-seat theatre. This trip includes: a guided tour of the highly acclaimed Arts of the East from the Bruschetti Collection (13th-17th Century), an Architectural Tour of the Museum plus a Tour of the Ismaili Centre.